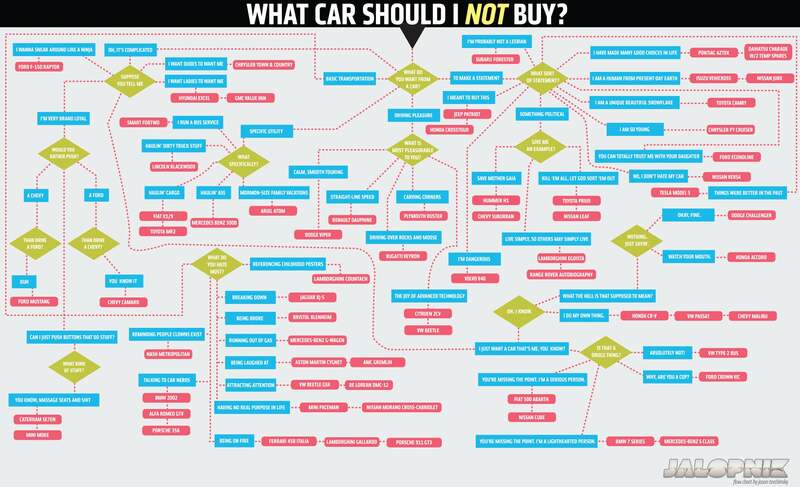 In the past, we've done all we could to help you pick a new car, classic car, or SUV thanks to the blackest magic of flow charts. But our crack team of auto-selection researchers on a private island in Nick Denton's bathtub have come up with a new criteria: what car should you not buy. See, deciding on what car to buy is never easy, and sometimes there's many wonderful cars out there that have the potential to make your life complete. So narrowing down that field is important, which is why sometimes knowing exactly what to stay the hell away from is key. As usual, this chart was developed on the Jalopnik Mainframe, located deep underneath Canter's Deli in Los Angeles, behind the pickling vats. Using DNA data collected from your dander, saliva, and other fluids acquired through one of Kinja's several hidden features, we managed to produce a chart that should be guaranteed to find you a car you never want to drive at all. So, have at it! I sure hope this helps you not find the car you've always never wanted. Click the EXPAND button on the top left or HERE to see the large version of the chart.